There's a new sharing service in town: Buffer, which allows you to share links on your own schedule--instead of automatically posting whatever you want to share, it sends links to your Facebook and Twitter accounts at scheduled times. The service has been working out kinks since September, and it finally rolled out to the public today. According to studies conducted by Buffer, strategically timing your posts increases the number of clicks by up to 200 percent. Scheduling when your links and posts go live lets you ensure they hit the web at times they're likely to be read--rather than buried or ignored. This isn't terribly surprising, since other research has shown that Web users have extremely predictable browsing patterns. To use Buffer, you'll first have to register for an account on its Website. 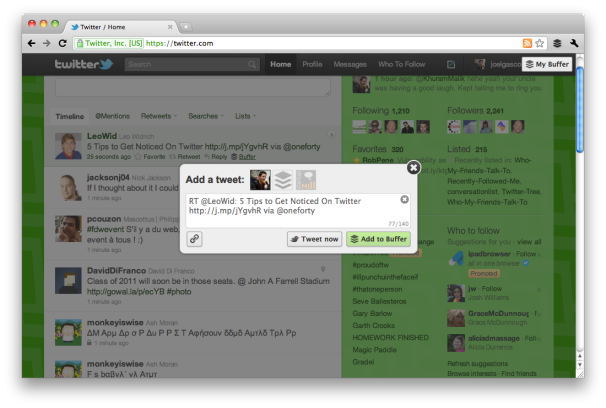 Here you'll also set the schedule for your links sent to Buffer. Unlike other "pre-posting" services such as TweetDeck and HootSuite, Buffer doesn't require you to choose a scheduled time every time you come across a shareable link--rather, it just automatically posts whatever you've picked up around the web according to the schedule you set. By default, the service suggests four times, but you can add more. Once you've registered and set up your account, all you have to do is click on the Buffer button when you're on a Webpage you'd like to share. A dialog box will pop up and you'll be able to send your comments, along with the page link, to your Buffer account. Your links will be stored there until the next scheduled time for posting. Once you're registered, every time you click on the Buffer button on a web page, a dialog box will pop up and you'll be able to send your comments about the page and its link to your Buffer account. Your links will be stored there until the next scheduled time for posting. In addition to its button program, Buffer has an Android app, as well as an iPhone app in the works. 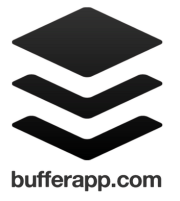 Currently, iPhone users and other non-Android users can use Buffer's email workaround to funnel links to the service.